A cashier’s check is a safe way to make large payments. Most banks and credit unions offer them. What is a cashier’s check? 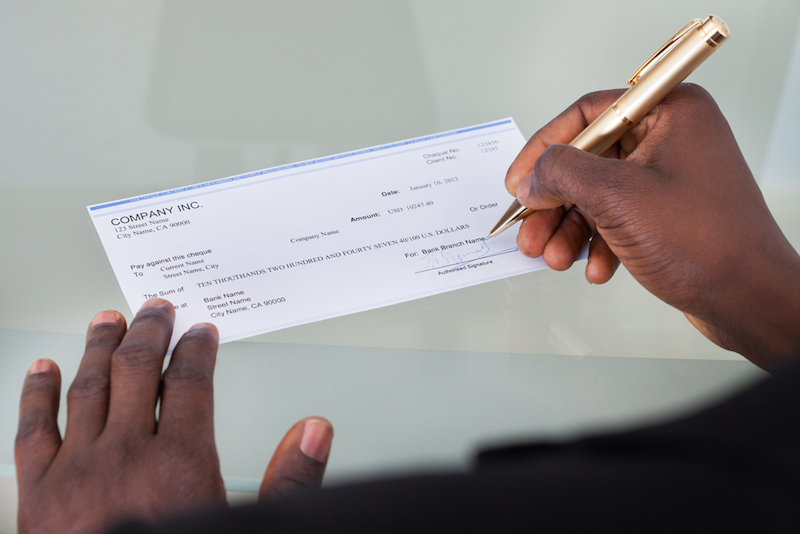 A cashier’s check is a check drawn from a bank’s own funds, instead of yours, and signed by a cashier or teller. It is unlike a regular check because the bank guarantees payment, not the check writer. Cashier’s checks are best for large purchases, such as a car or house sale, when you likely can’t use a debit or credit card. These checks have extra security features — such as watermarks and sometimes signatures by two bank employees — that make counterfeiting more difficult. So when you purchase one from a bank or credit union, all parties can be confident that the transaction is secure and the risk of theft or fraud is minimal. A cashier’s check can also be called an official check. How can I get a cashier’s check? Have the exact amount and recipient’s name ready before requesting the check, as well as personal identification. Cashier’s checks are drawn on a financial institution’s funds, but you supply the check amount to your bank ahead of time. And you need the name of the “payee,” the business or person you are paying, since you can’t get a blank cashier’s check. You should also have your ID ready; the teller will probably ask to see it. Visit a nearby branch and request the check from a teller. This is the standard way, but some banks, especially online-focused ones, make other methods available such as calling or sending an online message to their customer support team. In those cases, a cashier’s check would then be mailed to your recipient, which takes longer. If you need the check that day, visit a branch if your bank has one, or find a bank or credit union that accepts non-customers. Pay the check amount plus any applicable fee. If the funds are in an account at that institution, the full amount of the check will be frozen in your account or withdrawn when the check is issued. Have enough in the account to pay any fee as well. If the bank gives checks to non-customers, cash would be the main payment method. The teller will issue and sign the cashier’s check. Get a receipt. Ask for proof of payment. You might be able to use this to track the check. If you don’t have a checking account at a bank or credit union, you might need to open one. Banks and credit unions are the only institutions that can issue cashier’s checks, and they aren’t required to provide them to people who aren’t customers. Some do it, but at least three national banks don’t issue them to anyone but account holders. If opening a bank account isn’t practical, a money order might be your next-best option. What are the fees for a cashier’s check or a certified check? Many banks and credit unions offer cashier’s checks and certified checks, though not all offer both, and some differ on terminology, calling them “official checks.” Ask your financial institution for availability and pricing. Some financial institutions offer reduced fees or no fees for account holders. Here’s a list of official check fees at popular banks. Cashier’s checks: $10 for certain account holders, free for Preferred Rewards program customers. Cashier’s checks for 360 Checking customers: $20 online with overnight shipping; $10 in branch. Cashier’s checks free for customers. Cashier’s checks: $10; free with a primary Portfolio Checking account. Cashier’s checks: $10 for account holders. Free official checks for customers. Cashier’s checks: Two free per member per day, $5 for each additional check. Cashier’s checks: Free for holders of certain accounts, including Performance Checking, Virtual Wallet Performance, Performance Select Checking and Virtual Wallet Performance Select. $10 fee per check for all other accounts. Certified checks: $15. Official checks are $10, but the fee is waived for customers with Premier Plus Checking or Premier Plus Money Market Savings. Free official checks via standard delivery. Overnight, weekend and holiday delivery costs extra. Official checks: $8 for bank customers and $15 for noncustomers. No charge for Select and Signature Advantage checking accounts. Official checks: $8; fee is waived for TD customers who have Relationship, Premier or 60-Plus Checking accounts. Cashier's checks: $8. Fee is waived for military customers. How can I avoid cashier’s check fraud? Avoid taking a cashier’s check from someone you don’t know. If you do receive one, wait to use the funds until several days after the check has been deposited, or check with your bank to make sure it has cleared. Don’t accept a cashier’s check from someone you don’t know. Try not to use the funds — even if you can — until the check clears. Although funds from a cashier’s check deposited into a bank account are usually available the next day, many banks place a hold on amounts over $5,000 until the check has been cleared by the issuing bank. In some cases, this can take days, but that helps protect against cashier’s check fraud. What if I lose the check? Canceling a cashier’s check is generally not an option. If you lose a cashier’s check, the bank may require that you get an indemnity bond before issuing another one. The bond, which is not that easy to get, makes you liable for the replacement check, according to the U.S. Office of the Comptroller of the Currency. The bank regulator recommends contacting an insurance broker for help. Even with the bond, the bank may require that you wait more than a month for a replacement check. Have the exact amount and recipient’s name ready before requesting the check, as well as personal identification. Visit a nearby branch and request the check from a teller. Pay the check amount plus any applicable fee.